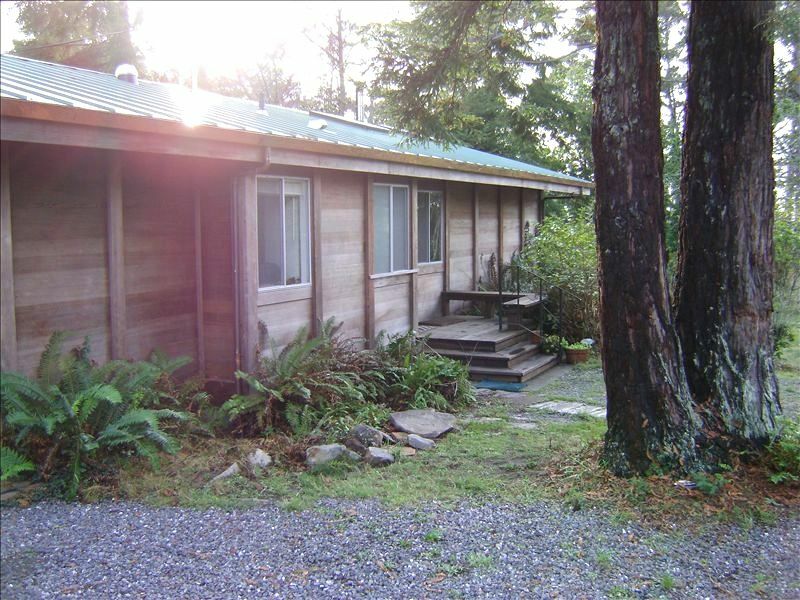 This home is conveniently located between Fort Bragg (5 minutes away) and the Village of Mendocino (10 minutes away). Located 1/4 mile from the beach, the home is also close to state parks (Jug Handle, Russian Gulch, Redwood Forest, Van Damm and McKerricher) which are especially great for hiking, biking and beach access. The home is very private, set on two wooded acres. A grassy yard opens into a meadow surrounded by redwoods, pine and fir. The house features cathedral ceilings and warm wood floors throughout, a completely equipped kitchen, cable TV/VCR, CD player, telephone, toasty wood-stove with a glass window for dinners in firelight, and a large back&side deck with outdoor dining and a barbecue for grilling. This Mendocino house has a king, a queen, and two trundle beds (each of these beds can sleep two singles or make into queen size beds). All firewood, linens, kitchen supplies, and bedding are provided for your convenience as well as a washer and dryer. Portable crib is available. Cozy and perfectly located. Kids enjoyed the swing on the tree. They had fun playing in the yard. Matt and Cathy were extremely prompt in responding to any questions we had. Thanks to both of them. The house is close enough to the ocean that one can hear its pleasing rumble. The great room's vaulted. tongue-and-groove ceiling makes it seem even larger, and the woodstove is wonderful. The beds are comfortable. The kitchen is small, but very adequate. The only thing I couldn't find were measuring cups. One thing to note is the counters are sub-standard in height, so doing dishes was uncomfortable due to how low the sink was, and I'm only 5'6". I imagine they were perhaps made to be wheelchair friendly. We would stay again. Just stayed for a couple night, but it was amazing! Quiet and cute and roomy! Definatly staying again! Tranquil, perfect accommodations, close to both Fort Bragg and Mendo. Will for sure be back.